Citation: Uzzaman MA, Bakar J, Rahman RA, et al. Storage stability of spray-dried tilapia meat powder produced under optimized condition. J Food Technol Pres 2018;2(1):6-14. Storage time and temperature are the major factors affecting the rate of loss of quality and shelf life of fish . Research on the shelf-life and quality changes of fish mince has mainly been performed on surimi under frozen storage conditions [2-4]. However, there are some disadvantages associated with frozen storage  including freezer burn, product dehydration, rancidity, drip loss and product bleaching which can have an overall effect on the quality of the frozen foods. In powder form, surimi can be kept at room temperature without frozen storage. Compared to frozen surimi, powdered surimi offers many advantages in commercial food production, such as ease of handling, lower cost for distribution, easy to store and useful in dry food mixes application [6,7]. Different drying methods have been tried to process surimi into powder or dried proteins: freeze drying methods was used by Mastuda and Diaz-Sobac et al. , while Huda et al. reported that freeze dried surimi powder from different fish species has superior functional properties. The effect of spray drying was studied by Niki et al. and Venugopal et al. . Huda et al. produced surimi powder using conventional oven at 60°C and reported the effect of cryoprotectant on functional properties. Musa et al. prepared surimi powder via solar drying and the powder has had acceptable functionality. Shaviklo et al. compared stability, functionality and sensory characteristics of spray-dried and freeze-dried fish protein powder. Successful development of fish protein powder from Alaska pollock (Theragra chalcogramma), lizard fish (Saurida tumbil), threadfin bream (Nemipterus japonicas), purplespotted big-eye (Priacanthus tayenus), mackerel (Scomber australasiars), fat sleeper (Dormitator maculathus), croaker (Johnius dussumieri), cod (Gadus morhua), common carp (Cyprinus carpio) and saithe (Pollachius virens) have already been reported [9,12,14-20]. Ramirez et al. produced freeze-dried surimi from tilapia and evaluated its emulsifying ability. More recently, detailed study on physicochemical properties of fish protein concentrate and fish protein hydro lysate from tilapia has been reported by Foh et al. . Dried surimi is quite similar to fish protein concentrate (FPC) particularly with respect to high protein content . However, the process to prepare FPC involves solvent extraction followed by dehydration of the fish meat which is costly and therefore not commercially viable [22,23]. The present study is unique/different from the others because the whole tilapia mince rather than the fish protein concentrate (FPC) has been converted into powders via spray-drying and without employing solvent extraction. Food items such as dairy products and fruit juices are regularly converted into powders by spray drying. Moreover, the process of making free flowing dispersion should be cost-effective because of the cheap raw material and superior final product. The production of spraydried tilapia fish powder (SDFP) can add value to the ultimate low commercial fish and might be used for developing formulated seafood and ready-to-eat food products. Functionality and stability of a FPP are very important for its application in the food industry as they affect food quality and acceptance. Gelation is one of the most important functional properties which determine the suitability of incorporation of a particular substance into food products. The ability of protein to form gel and provide a structural matrix for holding water, flavours, sugars and food ingredients is useful in food applications . Studies on storage stability of vacuum packaged FPP from Alaska pollock revealed that it could maintain its functional properties for 6 months at 5°C, but these properties were lost very quickly when FPP was stored at 30°C [10,25,26]. On the other hand, Ramirez et al. showed that, freeze-dried FPP can retain excellent functionality for up to 9 months at low temperature (-18°C). Venugopal et al. reported storage stability of two months for spray dried threadfin bream powder at ambient temperatures under aerobic packaging conditions. The objective of this study is to produce meat powder from red tilapia under optimized spray-drying conditions and also to determine the storage stability of the meat powder with respect to its gelling properties, colour, moisture content and water activity at refrigerated, room and accelerated storage temperature for up to 90 days. The storage stability study also provides shelf life of the spray-dried powder over time. The half-life of the spray-dried tilapia powder kept at 10°C, ambient temperature and elevated temperature at 40°C were predicted to be approximately 14 months, 5 months and two and half months, respectively. The fresh live tilapia was purchased from wholesale market and was immediately brought to laboratory for further processing. The meat slurry was prepared as described in Chapter 5 and was spray-dried in a pilot scale spray dryer (Niro A/S, GEA, Germany) under optimized condition with 28.69% maltodextrin as a carrier material and at an inlet air temperature and outlet air temperature of 176.84°C and 95°C, respectively. The powder produced was collected for the stability study. Proximate analyses were conducted on raw tilapia mince and mince powder after spray-drying. Official methods of the AOAC  were used to determine moisture, ash, fat and crude protein by Kjeldahl nitrogen determination (%protein= %N × 6.25). The spray-dried fish powders (SDFP) weighing approximately 20g were sealed under aerobic conditions in pouches of polypropylene bags (size: 125 210 mm thickness: 80 μm). The packed powders were kept at different storage temperatures viz. refrigerated temperatures of 4°C and 10°C, ambient temperature (30°C) and elevated temperatures of 40°C and 60°C. Sampling was carried out at 0, 15, 30, 45, 60, 75 and 90 days of interval for gelling properties, appearance (color), water activity and moisture content. All analyses were carried out in triplicates. The Least Gelation Concentration (LGC) of the spray-dried fish powder was determined according to Miller and Groninger . Powder suspensions of 1-15% (w/v) were prepared in 10 ml distilled water in test tubes. The tubes containing the suspensions were then heated for 30 min in a gentle boiling water bath, after which the tubes were cooled rapidly in water at 4°C for 60 min. Each tube was then inverted one after the other. The LGC was taken as the concentration when the sample from the inverted test tube did not fall or slip. The colour measurements of spray-dried tilapia powder were carried out using Minolta Chroma Meter (Model CR-300, Japan). The equipment was calibrated and standardized with a white colour standard calibration plate as proposed by the manufacturer. The results were expressed in L, a, b values as a colour coordinates in which L was lightness or darkness (black, L=0; white, L=100), +a was the redness, -a was the greenness, +b was yellowness, and -b was blueness. The moisture content of the spray-dried tilapia powders was determined according to AOAC, 1984. Triplicate samples of powder (3 g each) were weighed in porcelain crucibles and then dried in a vacuum oven at 105°C for 24 hours. The samples were removed from the oven, cooled in a desiccator and weighed. The drying and weighing processes were repeated until constant weight was obtained. Water activity was measured using a water activity meter (AQUALAB Series 3 TE, USA). The sample bowl was filled to 2/3 (approximately) with spray-dried tilapia powder and inserted into the measuring bowl. The measuring bowl was placed underneath. Display in the standby mode was read at 25°C. Storage stability of spray-dried tilapia mince powder was expressed in terms of rate constant (k) and half-life value (t1/2) according to Cai, et al. . Rate constant (k) and half-life value (t1/2) of gelation capacity were calculated using the regression analysis of ln (Least gelation concentration %) versus storage time when plotted on natural logarithmic scale. Denaturation rate constants (k) were obtained from the slope of the plot and the half-life was calculated as t1/2=ln2/k. Minitab statistical Package Version 14 (2004) was used for the statistical analyses. All experiments in this study are reported as mean of three replicate analyses. One-way analysis of variance (ANOVA) was carried out to compare between the mean values of different species of the seeds. Differences in the mean values were determined at P<0.05. Table 1 shows proximate composition of tilapia mincemeat. Ramirez et al. also found similar composition in the frozen surimi of tilapia where moisture content was 78%, protein 15.1%, fat 0.48% and ash 0.42%. Freeze-dried surimi had 4.6% moisture and protein content was 62%. Carbohydrate content was about 8% and fat and ash content were 2.9% and 1.6% respectively. On the other hand, Shaviklo and others  produced spray-dried powders from saithe and the reported value for protein, moisture, ash, fat and carbohydrate contents were 74.5%, 5.8%, 1.4%, 3.2% and 15.1%, respectively. In our study, maltodextrin as carrier material was added to a concentration of 27.64% which could possibly explain the comparatively lower amount of protein in the tilapia powder. Table 1: Proximate compositions of tilapia mince before and after spray-drying. Gelation is a two-stage process involving the initial denaturation of proteins into unfolded polypeptides, which is then gradually associated to form the gel matrix, if attractive forces and thermodynamic conditions were suitable. Because of the high temperature coefficient of denaturation, it may be expected that the first step in the gelation process would be greatly accelerated compared to the second step, involving network formation; therefore higher temperatures should result in the formation of finer, firmer gels. However, conditions of the cooling step, which is usually required to permit gelation, also affect physical characteristics of the gels. Upon cooling, the uncoiled polypeptides associate to form a network. Cross linking may involve multiple hydrogen bonds, ionic attractions, disulphide bonds, hydrophobic associations or a combination of these . The least gelation concentration which is defined as the lowest protein concentration at which gel remains in the inverted tube was used as an index of gelation capacity. The lower the level of the least gelation concentration, the higher the gelling ability of the protein ingredient . Gel-forming ability is affected by the extent of denaturation of myofibrillar proteins during heating, relative concentration of myofibrillar versus sarcoplasmic and/stroma protein, and additives used for protecting proteins during frozen storage . However, gelation of fish protein powder (FPP) also depends on factors such as drying method, amount of additives, protein concentration and pH . The least gelation concentration for spray-dried tilapia powder used in the study before storage was found to be 8.67%. The value obtained is lower than those reported for Great Northern bean (10%) , lupin seed flour (14%) , cowpea (16%) , pigeon pea flour (12%)  and pumpkin seed 14.0% as reported by Olaofe et al. . Recently, better gelling ability of saithe (Pollachius virens) protein powder has been reported by Shaviklo et al. , where freeze-dried powder with or without additive could be gelled at 2% and 6%, respectively. On the other hand, LGC of spray-dried saithe protein powder was found to be at concentrations of 10 g/kg protein. In another study, the LGC of maize-tilapia flour blend ranged from 4% to 6%, when compared with maize flour which has an LGC of 10% . Similar gelation values were reported by Huda et al. in freeze-dried surimi powder of lizard fish (4.2%), threadfin bream (1.2%) and purple-spotted big eye (1.8%). Table 2 shows the effect of storage temperature and time on the gelling ability of spray-dried tilapia powder. The gelation capacity was found to be affected by both storage temperature and time probably due to the denaturation of myosin and actomyosin which are responsible for gelation. At refrigerated temperature (4°C), the LGC ranged between 8-10% up to 90 days (p<0.05) of storage. At 10°C temperature, the gelation capacity was not altered up to 30 days and after that the powder was found to form gel at slightly higher concentration e.g., 9% after 60 days, 10% after 75 days and 12.75% after 90 days of storage. Similar trend was observed for powder stored at ambient temperature, where no significant change in gelation capacity was observed up to 30 days and the total increment of gelation concentration at 90th day of storage was 5.38% with significant (p<0.05) increment in LGC and hence the loss of gelation capacity was observed after 45 days of storage. Table 2: Gelling properties of tilapia powder as influenced by storage time and temperature. Under accelerated storage conditions, significant loss of gelling ability over storage time was observed (p<0.05) for spray-dried tilapia powders stored at 40°C. The powder could retain its gelation capacity up to 60 days storage with LGC observed to be at 15% (w/v). However afterwards, the powder lost its gelling properties and no gel could be formed with tilapia powder even when higher than 15% concentration was employed. The complete loss of gelling properties was witnessed for powders stored at 60°C only after 15 days. According to Mackie et al. , the gelling functionality of meat proteins is generally regarded to be greatly reduced after dehydration. Yet if some acceptable level of gelling functionality could be achieved in meat powders, however diminished from the raw wet state, the cost saving benefits could still make meat powders attractive to the food industry as a substitute for raw meat ingredients. In this study, the spraydried tilapia powder could be transformed into gel at the concentration between 8-15%, when stored at ambient temperature for three months and at accelerated temperature (40°C) for up to two months. Niki et al. found that freezedried FD powders retained greater functionality compared to spray-dried SD powders. However, the storage stability of SD powders is likely to be superior to FD powders especially if ambient storage conditions are considered. Colour measurement is an important quality indicator as it reflects the sensory attractiveness and the quality of the powders produced in spray drying process. Shaviklo et al. suggested that the colour of the fish powder depends on several factors such as mixing fish flesh with cryoprotectants, drying methods, drying temperature and lipid oxidation. In this study, L value of spray-dried tilapia powder (97.69) was found higher than that of freeze dried powder (92.10) and oven-dried powder (90.10) of threadfin bream as reported by Musa; freeze-dried surimi powder from Threadfin bream (89.57), purple-spotted bigeye (88.33) and lizardfish (85.59) obtained by Huda et al. and spray-dried powder (47.80) and freezedried protein powder (41.20) of saithe as reported by Shakivlo et al. indicating that the color of fish powder depends mostly on the fish species and also on processing conditions. The effect of Lightness (L*), redness (a*) and yellowness (b*) values of surimi powder stored under different temperatures are shown in Table 3. From the table, it is evident that the powder experiences no change in color at refrigerated temperature of 4°C and 10°C. The L value of spray-dried tilapia powder (SDTP) did not change significantly (p>0.05) when stored at refrigerated temperature for up to 90 days. Venugopal et al. also found that the spray-dried threadfin bream powder remain colorless even up to 120 days when stored at 10°C. The spray-drying conditions used were similar with the present study; the inlet and outlet temperature being at 180°C and l00°C, respectively with feed rate of 2L/h. Table 3: Hunter colour values of tilapia powder as influenced by storage time and temperature. On the other hand, storage at ambient temperature (30°C) as well as at elevated temperature such as 40°C and 60°C were found to exert a great influence on degrading the colour. This was most pronounced for the lightness variable (L*), but also for yellowness (b*) value of the powder. The browning of the dried sample can be identified from L values. The lower the L values, the higher the powders turned brown in colour. The L value was found to decrease gradually (p<0.05) when stored at ambient and elevated temperatures and the most reduction was observed for the highest storage temperature of 60°C. The darkest powder with L* value of 85.4 was observed for powders stored at 60°C for 90 days. Generally, the powders produced via oven drying showed increased a* and b* values; whereas, minimal colour deterioration was reported in powders produced via freezedrying. Musa showed that under different drying conditions, surimi dried at low temperature was better in L*, b* values. In contrast, Shaviklo et al. found that, the spray-dried saithe powder was whiter and lighter than freeze-dried FPP. Homogenization of washed mince slurry with additives in a high-speed homogenizer, prior to spray-drying, disrupted fish mince tissue and pigments and gave a homogenized white solution for feeding into the spray-dryer. High temperature, short time in the spray-drying process and possibly crystallization of the lyoprotectant during drying resulted in a whiter powder. The spray-dried tilapia powder used in this study had an initial moisture content of 2.63%. The value was lower than the maximum moisture specification for most dried powder in the food industry which is between 3 to 4 g/100 g . The changes in the moisture content of tilapia powder throughout the storage period of 90 days are shown in Table 4. The moisture absorption by SDTP was noticed at refrigerated temperature and the moisture content was gradually increased with increase in storage period. Table 4: Moisture content of tilapia powder as influenced by storage time and temperature. The moisture content of tilapia powders significantly increased from 2.63% to 4.27% after 60 days of storage and finally to 4.41% after 90 days of storage at 4°C (p<0.05). Moisture adsorption was slightly lower at storage temperature of 10ºC than 4ºC and the maximum value (4.08) recorded was at 75 days of storage. At ambient temperature, no significant reduction in the moisture content was observed for powders stored up to 45 days (p>0.05). However afterwards, gradual adsorption of moisture was noticed with significant increase in moisture content value of 3.88% observed after 90 days. This could be due to the weak barrier property of the packaging material which absorb higher amount of moisture in the packaged powder. Similar observations were made by Christinsen et al. for spray-dried dry emulsions stored for six months. During storage at ambient temperature, the moisture content in the dry emulsions was slightly increased from 0.9 to 1.6% whereas at elevated temperature (40°C), the moisture content was increased to 2.5%. Even though, the moisture content of tilapia powder was found to increase during storage under refrigerated and ambient temperature, the value was still below 5%. Pike  pointed out that moisture content below 8% improves flow characteristics. In case of fishmeal, moisture contents between 5% and 10% are considered quite normal . However, under accelerated storage condition of 40°C, the moisture content of the powder tends to decrease over time. The reduction in moisture content was not significant for storage period up to 45 days (p>0.05). Prolonged exposure at 40°C resulted into outward moisture migration from the packaging material and significant reduction in moisture content from 2.63 to 1.89% after 90 days of storage (p<0.05) was observed. At extreme storage temperature of 60°C, the moisture content gradually declined 0.93% after 30 days of storage (p<0.05). However, afterwards, the powder become brownish, sticky and form clumps or small aggregates. As a result, the moisture content was found to increase again at 45 days of storage. The value increased to 1.47% at 45 days and finally to 1.82% at 90th day at the end of the experiment. Water activity (Aw) is an important index for spray-dried powder because it can greatly affect the shelf life of the powder produced. It is defined as the ratio of vapour pressure of water in a food system to vapour pressure of pure water at the same temperature . It is different from moisture content as it measures the availability of free water in a food system that is responsible for any biochemical reactions, whereas the moisture content represents the water composition in a food system. Water activity influences rate and extent of non-enzymatic browning reaction and lipid oxidation of food products, the reaction increases with increasing water activity . High water activity indicates more free water available for biochemical reactions and hence, shorter shelf life. Generally, food with aw<0.6 is considered as microbiologically stable and if there is any spoilage occur, it is induced by chemical reactions rather than by microorganism. As shown in Table 5, the water activity of the powder at 0 day of storage was 0.253 indicating that the spray-dried powders produced were relatively stable microbiologically and have longer shelf-life. However, the storage conditions also played an important role in this matter. At refrigerated temperature, the water activity significantly increased from 0.255 to 0.470 and 0.447 at 4°C and 10°C, respectively after 90 days of storage (p<0.05). The water activity of powder stored at ambient temperature had increased significantly (p<0.05) from 0.253 to 0.305 after 15 days and then gradually from 0.313 at 45 days of exposure to 0.361 after 90 days of storage. The total increase of water activity was about 2.7% during 90 days of storage at 30°C. At 40°C, the powder become dry and the water activity was gradually decreased from 0.255 to about 0.212 (p<0.05) after 90 days of storage. As in the case of moisture content, the water activity of the powder decreased significantly from 0.255 to 0.076 at 30 days of storage. After that, the powder particles attached to one another and form clumps or chunks. As a result, the powder could absorb more water which results into higher water activity of the powder starting from 45th day (Aw- 0.093) until 75 days of storage (Aw-0.129) (p<0.05). Table 5: Water activity of tilapia powder as influenced by storage time and temperature. In order to determine the rate constant and the half-life reaction of gelation capacity, the kinetic of this parameter must be first considered by analyzing the experimental data on least gelation concentration (LGC) of the stored tilapia powder as a function of storage time and temperature. The natural logarithm of the ratio of the LGC is plotted against storage time in Figures 1-3. The linear line obtained by connecting the data plot indicated that LGC denaturation in tilapia powder followed the first order reaction kinetics. It was observed that all data were best fit by a first order kinetic model [ln C=ln Co+k(t)] with R2> 0.89. 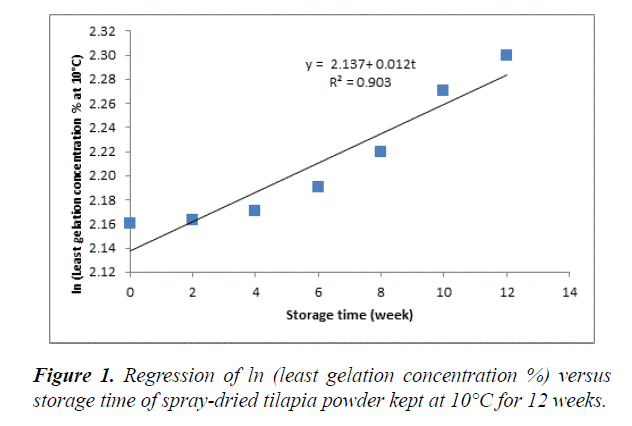 Figure 1: Regression of ln (least gelation concentration %) versus storage time of spray-dried tilapia powder kept at 10°C for 12 weeks. Figure 2: Regression of ln (least gelation concentration %) versus storage time of spray-dried tilapia powder kept at 30°C for 12 weeks. 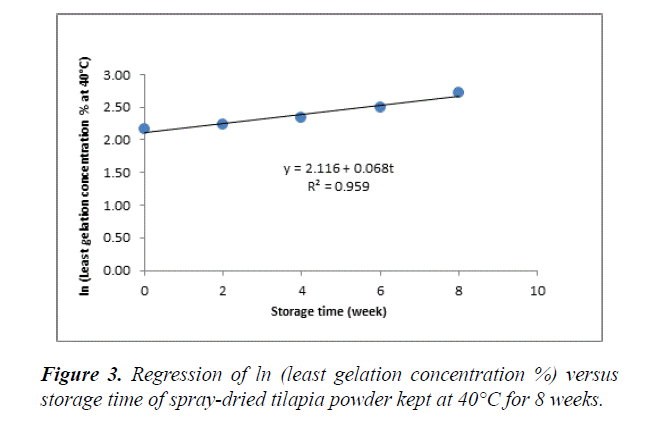 Figure 3: Regression of ln (least gelation concentration %) versus storage time of spray-dried tilapia powder kept at 40°C for 8 weeks. The degradation rate and stability of gelation capacity were expressed as rate constant (k) and half-life time (t1/2), respectively. After 12 weeks of storage at 10°C, the denaturation rate constant in spray-dried tilapia powder was 1.2 10-2 week-1 and t1/2 value of 57.76 weeks followed by slightly higher rate constant at 30°C storage (k=3.4 10-2 week-1) and t1/2 value of 20.38 weeks. Higher value of K indicated greater denaturation of gelation capacity in the tilapia powder. The gelling ability was more prone to temperature and the loss of gelling ability was most pronounced at accelerated storage temperature of 40°C. After 8 weeks of storage at 40°C, the denaturation constant (k=6.8 10-2 week-1) was even higher and the half-life shortened to 10.19 weeks. The results demonstrated that the quality and stability of spraydried tilapia powder was affected by storage time and storage temperature. Gelation capacity was markedly altered by storage temperature rather than storage time. The half-life of the spray-dried tilapia powder kept at 10°C, ambient temperature and elevated temperature at 40°C were predicted to be approximately 14 months, 5 months and two and half months, respectively. Denaturation of protein powder in spraydried tilapia powder was according to the first order reaction model and the extent of denaturation was higher at 40°C. The powder had minimum tendency to undergo browning at lower temperature (4°C and 10°C). The colour of the powder showed more changes during storage at 30°C, than at 0°C. It also showed high affinity towards moisture under these packaging conditions which suggests the need for a suitable packaging material for quality retention during storage. At extreme storage condition, it was susceptible to browning and lost its gelling properties even after two weeks of exposure at 60°C. The least gelation concentration during storage varied from 8-15% (w/v) indicating that the powder at this concentration can be used in the food industry for developing formulated seafood and ready-to-eat food products. The study was supported by the research grant from the Fishery Research Institute, Batu, Maung, Penang, under the Ministry of Agricultural and Agro-based Industry, Malaysia. Whittle KJ. Opportunities for improving the quality of fisheries products. In: Luten JB, Borrosen T, Oehlenschlager J (eds.) Seafood from producer to consumer, integrated approach to quality. Proceedings of the International Seafood Conference on the 25th anniversary of WEFTA, Netherlands, 13-16th November 1995, Elsevier, Amsterdam, 1997;549-560. Aguilera JM, Francke A, Figueroa G, et al. Preservation of minced pelagic fish by combined methods. Int J Food Sci Tech. 1992;27:171-7. Kose S, Uzuncan Y. Some quality changes of surimi produced from anchovy (Engraulis ancrasicholus) during frozen storage 20°C for five months. Ege University Waterworks Magazine. 2000;17(3-4):119-27. Reppond KD, Babbit JK, Berntsen S, et al. Gel properties of surimi from Pacific herring. J Food Sci. 1995;60(4):707-10. Kropf DH, Bowers JA (1992). Meat and meat products. In Bowers (eds. ), Food Theory and applications. New York: Macmillan, 1992;22-9. Green D, Lanier TC. Fish as the `soybean of the sea'. Proceedings of the International Symposium on Engineered Seafood Including Surimi, Washington: National Fisheries Institute, 1985;42-52. Niki H, Matsuda Y, Suzuki T. Dried forms of surimi. Surimi Tech. 1992;209-44. Diaz-Sobac R, Vasquez HM, CI Bernstein. Paper presented at IFT annual meeting 1995. CD-FSTA Current. 1990-1997. Huda N, Aminah A, Babji AS. Functional properties of surimi powder from three Malaysian marine fish. Int J Food Sci Tech. 2001;36(4):401-6. Niki H, Kato T, Deya E, et al. Water holding capacity, emulsifying capacity and storage ability of active fish protein powder. Bull Jpn Soc Sci Fish. 1983;49:91-6. Venugopal V, Chawla SP, Nair PM. Spray dried protein powder from Threadfin bream: Preparation, properties and comparison with FPC type-B. J Muscle Food. 1996;7:55-71. Huda N, Aminah A, Babji AS. Effects of cryoprotectants on functional properties of dried lizardfish (Saurida tumbil) surimi. Malaysian Applied Biology. 2000;29(1-2):9-16. Musa KH, Aminah A, Mustapha WAW, et al. Effect of solar drying on the functional properties of surimi. Proceedings of Innovations in Food Processing Engineering and Technology; 2002 Dec 11-13, Bangkok. Shaviklo GM, Thorkelsson G, Arason S, et al. The influence of additives and drying methods on quality attributes of fish protein powder made from saithe (Pollachius virens). J Sci Food Agric. 2010;90(12):2133-43. Niki H, Deya L, Kato T, et al. Studies related to development of a spray drying method for making active fish protein powder. I. The process of producing active fish protein powder. Bull Jap Soc Sci Fish. 1982a;48:999-1004. Niki H, Deya L, Kato T, et al. Studies related to development of a spray drying method for making active fish protein powder. 11. Some factors in the production of active fish protein powder. Bull Jap Soc Sci Fish. 1982b;48:1133-7. Chung YC, Ho ML, Chyan FL, et al. Utilization of freeze-dried mackerel (Scomber australasicus) muscle proteins as a binder in restructured meat. Fish Sci. 2000;66:130-5. Ramirez JA, Diaz-Sobac R, Morales OG, et al. Evaluation of freeze-dried surimi from tilapia and fat sleeper as emulsifier. Cyta J Food. 1999;2:210-4. Chavan BR, Basu S, Kovale SR. Development of edible texturised dried fish granules from low-value fish croaker (Otolithus argenteus) and its storage characteristics. Cmu J Sci. 2008;7:17-182. Eikevik TM, Stromment I, Alves-Filho O, et al. Effect of operating conditions on atmospheric freeze-dried codfish. Proceedings in 3rd Inter-American Drying Conference (IADC), Montreal, 2005;21-3. Foh MBK, Kamara MT, Amadou I, et al. Chemical and physicochemical properties of tilapia (Orechromis niloticus) fish protein hydrolysate and concentrate. Int J Biol Chem. 2011;5(1):21-36. Mackie IM. New approaches in the use of fish proteins. In: BJF (ed.) Development in Food Protein-2, Hudson, Essex, England: Elsevier Science. 1983;215-62. Finch R. Whatever happened to fish protein concentrate. Food Technol. 1977;31(5):44-7. Kinsella JE. Functional properties of soy proteins. J American Oil Chemists Society. 1979;56(3):242-58. Matsuda Y. Influence of platen temperature of freeze-drying on the kamaboko-forming ability of lyophilized kaen-surimi. Bull Jpn Soc Sci Fish. 1971;37(2):135-45. Matsuda Y. Influence of packing on the kamaboko forming ability of lyophilized Alaska pollack surimi during storage. Bull Jpn Soc Sci Fish. 1979;45:517-21. AOAC. 1990. Official Methods of Analysis (15thedn), Association of Official Analytical Chemists, Washington, DC. Miller R, Groniger HS. Functional properties of enzyme modified fish protein deviates. J Food Sci. 1976;41:268-72. Cai Y, Sun M, Corke H. Colorant properties and stability of Amaranthus betacyanin pigments. J Agric Food Chem. 1998;46(11):4491-5. Otte J, Schumacher E, Ipsen R, et al. Protease induced gelation of unheated and heated whey proteins: Effects of pH, temperature and concentration of proteins, enzyme and salts. Inter Dairy J. 1999;9(11):801-12. Akintayo ET, Adebayo EA, Arogundade LA. Chemical composition, physico-chemical and functional properties of akaa pulp and seed flours. Food Chem. 2002;77:333-6. Lanier TC, Carvajal P. Surimi gelation chemistry. In: Park JW (ed.) Surimi and Surimi Seafood, CRC Press/Taylor and Francis, Boca Raton, FL, 2005;435-89. Sathe SK, Salunkhe DK. Functional properties of great northern bean (Phaseolus vulgaris) proteins: Emulsion, foaming, viscosity and gelation properties. J Food Sci. 1981;46(1):71-5. Sathe SK, Desphande SS, Salunkhe DK. Functional properties of lupin protein concentrates. J Food Sci. 1982;47:491-7. Abbey BW, Ibeh GO. Functional properties of raw and eat processed cowpea (Vigna unguiculata),Walp) flour. J Food Sci. 1988;53:1775-7. Oshodi AA, Ekperigin MM. Functional properties of pigeon bean pea (Cajanus cajan) flour. Food Chem. 1989;34(3):187-99. Olaofe O, Adeyemi FO, Adediran GO. Amino acid and mineral composition and functional properties of some oil seeds. J Agric and Food Chem. 1994;42(4):879-81. Fasasi OS, Adeyemi IA, Fagbenro OA. Physicochemical properties of maize-tilapia flour blends. J Food Tech. 2005;3(3):342-45. Mackie IM. Fish protein. In: Hudson BJF (ed). New and Developing sources of food proteins (pp. 95-144). London, Chapman & Hill, Inc. 1994. Klinkesorn U, Sophanodora P, Chinachoti P, et al. Characterization of spray-dried tuna oil emulsified in two-layered interfacial membranes prepared using electrostatic layer-by-layer deposition. Food Res Int. 2006;39:449-57. Christensen KL, Pedersen GP, Kristensen HG. Preparation of redispersible dry emulsions by spray drying. Int J Pharmaceutics. 2001;212(2):187-94. Pike IH. Fish meal and oil press articles. International association of fish meal manufactures. 1989; U.K. International and West German press. Burt JR, Hardy R, Whittle KJ. Pelagic fish the resource and its exploitation. In: Urdahl N (ed.) By-products from pelagic fish, 1992;222:31. Cambridge: The University Press. Fennema OR. Water and Ice. In: Fennema OR (ed.) Food Chemistry (3rdedn), New York: Marcel Dekker Inc., 1996;18-88. Fontana AJ. Understanding the importance of water activity in food. Cereal Foods World. 2000;45(1):8-10.